The sweet and crunchy nature of this salad makes it a crowd-pleaser that’s great warm or at room temperature. Heat olive oil in a large skillet over medium flame. 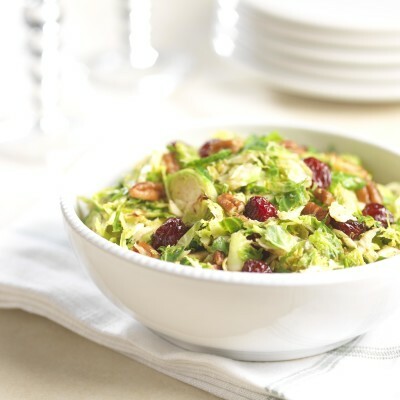 Shred Brussels sprouts in food processor fitted with slicing blade and add to pan along with chopped pecans. Cook while stirring for two minutes. Add nutmeg, ground ginger, salt and pepper and continue to stir and cook for another minute or two until Brussels sprouts are slightly wilted. Remove from heat, stir in lemon juice and cranberries. Serve warm or at room temperature.